Building secure Web applications isn’t easy and contains many aspects that the development team has to consider and take into account. 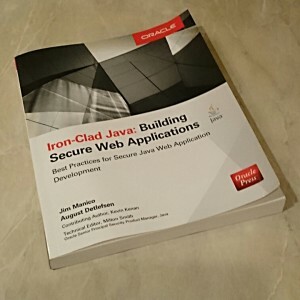 “Iron-Clad Java: Building Secure Web Applications” book is good starting point to learn concepts, tactics, patterns and anti-patterns to develop, deploy and maintain secure Java applications. With 304 pages the book is more about getting an overview and pointers for further reading and research but works quite nicely in that regard. As the name suggests, “Iron-Clad Java: Building Secure Web Applications” by Jim Manico and August Detlefsen, is targeted for Java developers and is suitable reading also for less technical people in the team like project managers and managers as it doesn’t go too deeply to technical aspects or code. After reading the book even the managers should get an appreciation and the vocabulary to discuss security with their staff. The reader should get a solid understanding of what is wrong with many web apps in general and what corrective measures to take to mitigate the issues. The book was published September 2014 and has 304 pages (ISBN-13: 978-0071835886). The book covers topics like secure authentication and session management processes, access control design, defending against cross-site scripting (XSS) and cross-site request forgery (CSRF), protecting sensitive data while stored or in transit, preventing SQL injection, ensuring safe file I/O and upload, using effective logging, error handling, and intrusion detection methods and also guide for secure software development lifecycle (secure-SDLC). The topics are written with theory and practice and so that they are approachable for developers new to security, for those that might be a little inexperienced but still providing useful nuggets for experienced developers. In good and bad the book gives somewhat opinionated answers what technics and tools you can use to address security issues but overall the advice is solid and un-biased and more or less framework agnostic. So, the lessons learned should apply to any project. For me, writing examples with e.g. JSP and Struts makes me question if also the other tools the book suggest (which I wasn’t familiar with) are suitable for modern Java EE application development. Something to look into after reading the book. Also OWASP seemed to have answer to almost every security aspect. Anyways, the book’s advice isn’t about using certain technologies but giving you something to think about and educating about security aspects in your Java Web application. What matters is that the book gives explanations of why you need to implement a specific control for a given issue, how you could do it and what the impacts are. This is what many security professionals miss when speaking to developers. The book tells you what the security problem is and then why and how you should fix that so it makes sense for developers. Taking care for Web application security isn’t just for architects and developers but it’s also a topic which importance whole team should know and understand. The “Iron-Clad Java: Building secure Web applications” gives good overview to security and is suitable for the whole development team to read.